Fluence Analytics CSO, Prof. Wayne Reed, will present new ACOMP data during the Polymer Reaction Engineering X (PRE 10) conference. PRE 10 will take place in Punta Cana, Dominican Republic from May 20-25, 2018 and is organized by Engineering Conferences International. The conference is a forum for academic and industry researchers to present breakthrough technologies and scientific advancements relating to polymer reaction engineering. Sessions during PRE 10 will include polymerization process modeling and control, developing trends in polymer chemistry, and advancements in product engineering. Prof. Reed’s presentation will take place on May 22 at 8:30 a.m. during the Process Engineering: Production Issues & Process Control session. The talk will detail the achievement of Automatic, simultaneous control of molar mass and composition in free radical copolymerization using ACOMP/Control Interface. 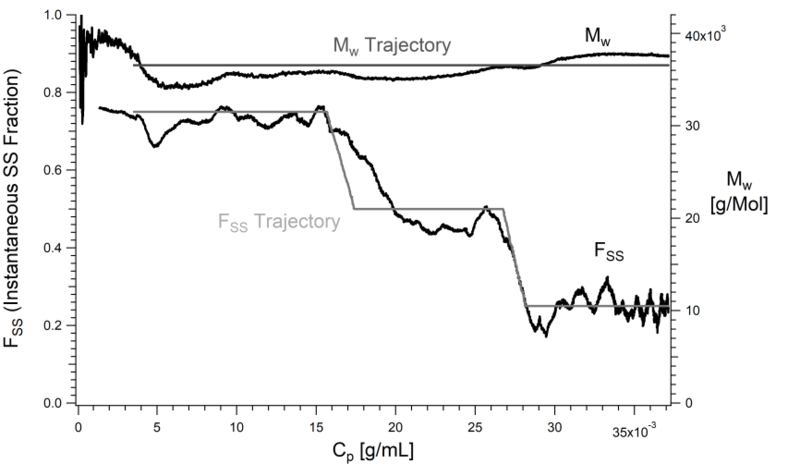 Originally, ACOMP was only used to control molar mass, and that involved the use of two proportionality parameters, αA and p. No detailed kinetic models were used during the automatic control of molar mass. αA is the conversion rate of monomer A, and p is the link between instantaneous weight average molar mass Mw,inst and monomer concentration. Applying this method to the simultaneous control of molar mass and composition requires adding the conversion rate of monomer B, αB. Figure 1: Copolymer with trimodal composition and constant Mw using comonomers Acrylamide and Styrene Sulfonate (SS). Fss is the instantaneous fraction of SS incorporated into chains. Email info@fluenceanalytics.com to arrange a meeting with Prof. Reed during Polymer Reaction Engineering X.